Meet Bella, an 8yr old Golden Retriever Brady & I have adopted through the Golden Retriever Rescue organisation. She is the most amazing dog with the best of personalities who has made our home & us her own. * Celsar Layennah foaled a lovely fine leggy colt for Celsar Arabians. He will be gelded and retained by the stud. * El Ishmael Sho'keem participates in the PINK Charity ride, completing 20km's successfully. Pictured with Mike Fletcher. 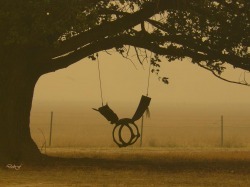 * Deb wins 1st & 2nd at the Wangaratta Agricutural Society Show's, Photography Competition in the Rural section. * Deb & Alisha [Hartz Arabians & Shetlands] flew out to S.A to participate in Sheridan Parks first Open Day. March saw the arrival of friends, Kathi McDonald [Catrin Arabians] & Julie [Bonnie Doon Arabians] from WA & Qld. Kathi & Julie called in on us on their way to the Australian Championships. We thoroughly enjoyed their visit. Pictured is Kathi greeting a very curious Celsar Layennah, who was hoping for an edible treat. 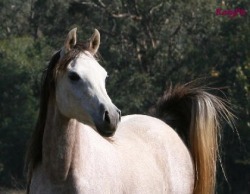 Rokewood Shiseido [Simeon Samuel x Rhamon Pascalle] who is on lease with Zameel Arabians has been positive tested in foal to Scrupulous [Mede x Chipala Cherida]. Seidi is due Christmas 2009. Congratulations to Kel and Ty.......we are thrilled for you and can't wait to see the resultant foal. El Ishmael Arabians extends their sympathies to all those who are dealing with pain and suffering inflicted by the bush fires. * Vale: Celsar Layyin. Layennah's beautiful dam has been laid to rest. Our thoughts and best wishes to all at Celsar Arabians. * News from Rhonda & Taya in Qld - Taya has been in the yards getting used to a day rug as well as a saddle and bridle on and off. Very promising to hear things progressing a little bit at a time. * News from Mike & Sho'keem in Vic - Sho'keem has been having extensive ground work in preparation for a rider. He has accepted the bridle & saddle without incident and has also had weight on his back. He seems keen to be out and about on his first ride. 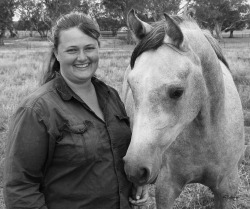 We would like to congratulate Rhonda Murray from Bowen Queensland on her recent purchase of El Ishmael Shataya. We are thrilled that Taya will be introduced to the world of endurance and wish both Rhonda and Taya all the best for the future. Linden Kumitra was pictured in the AHE, Dec 08/Jan 09 edition page 4 celebrating her 23rd birthday in October 2008.